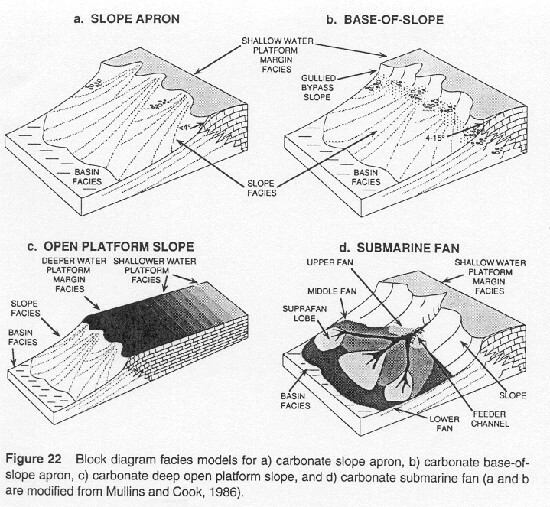 Rimmed platform slope apron: The carbonate apron in this model extends continuously from the basin along a gentle gradient (<4°) to a shallow water platform margin.The sediment deposited on this type of slope is predominately turbidites and debris sheets interbedded with suspension deposits.This slope type is best observed in ancient sequences, since most modern carbonate slopes form beneath steep forereef escarpments. 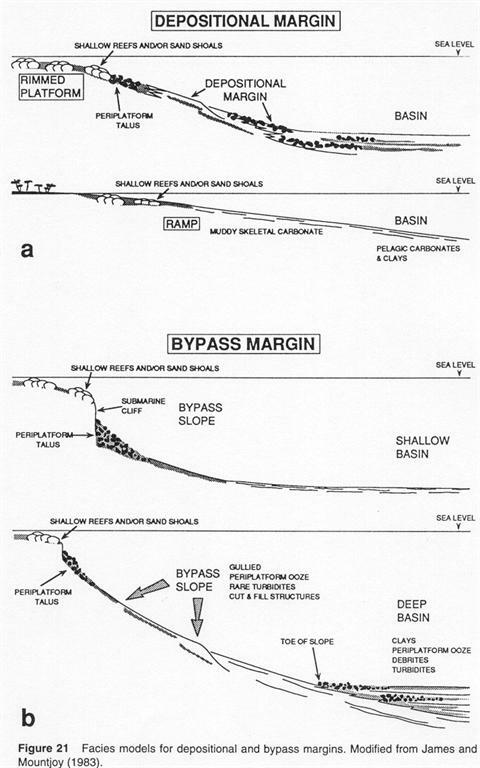 Rimmed platform base-of-slope apron: This type of slope forms down-slope from the platform/slope break along a steep gradient (>4°).Sediment transport occurs through a series of closely spaced gullies, which transport shallow water, and slope derived sediment through some portion of the upper to the middle slope.This is also known as a bypass margin.The sediment emerging from these gullies creates a series of small, interleaved fan-shaped deposits, forming platform-margin parallel facies belts.At the top of the apron course debrite and tallus are common, especially if a steep escarpment is present.This slope type is also well preserved in ancient examples. Open (unrimmed) platform apron: This type of slope develops in areas where the platform/slope margin is below depths of the carbonate factory.In this case the sediment is likely to be dominantly pelagic in origin.Also mass-wasting deposits including turbidites and debrites originating from platform margin are common. This type of slope is especially difficult to identify in the rock record because it is difficult to distinguish from rimmed shallow water platforms. Submarine Fans of carbonate: These slope deposits are believed to be built from a point source, fed by a major submarine channel.The fan consists of debris flow conglomerates and coarse turbidites.The sediment is dispersed in a radial fashion. (after Coniglio and Dix, 1992). Most modern carbonate slopes are characterized by a distinctive morphology that can generally be broken up into four zones. Platform Edge: This portion consists of a sediment wedge and is located in shallower water, behind areas of deep reef growth.These reefs are dissected by a series of sediment chutes that extend to an escarpment further down-slope.This wedge consists of sand sized grains, predominately made up of ooids, peloids, and coral remains. Wall: This is a near vertical escarpment, beginning at water depths of 40-60 meters and extending to depths of 130-140 meters.It is characterized by pits, caves, ledges and vertical overhangs.The wall produces significant amounts of silt to gravel sized grains through processes of biological production and bioerosion.Most of this sediment is transported further down-slope.The base of the wall is marked by an abrupt change in slope to a less steep gradient.Large talus blocks are commonly found at the base of the wall. Cemented Slope: The cemented slope starts at the base of the wall and extends to depths of 365 meters or greater.It is characterized by a well-lithified surface, steep slope angle, and internal bedding.The surface of the cemented slope is cemented with matrix micrite and lesser amounts of Mg-calcite, and aragonite.Grains within the cement consist of silt to pebbble sized skeletal fragments.Only a thin layer of unconsolidated sediment covers this portion of the slope. Sediment Slope: This portion consists of a wedge of unconsolidated sediment that onlaps the base of the cemented slope.The sediment is a mixture of skeletal and non-skeletal sands as well as carbonate mud.The sediment origin is primarily the wall and platform margin (described above). Brown, A.A., Loucks, R.G. Influence of Sediment Type and Depositional Processes on stratal Patterns in the Permian basin-Margin Lamar limestone, McKittrick Canyon, Texas in carbonate :Recent Developments and Applications. Ed. Loucks, R.G. and Sarg, J.F. AAPG Memoir 57, Tulsa: 1993. p.145.